How and When Do Puppies Eyes & Ears Open? There are few things more adorable than a pile of mewling puppies just a few days old. But unlike humans, who are born with fully functioning senses, puppies are both blind and deaf at birth, unable to navigate the world more than a few inches away from their attentive mom. 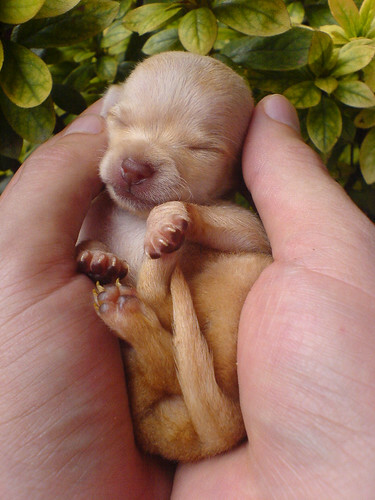 When they first greet the world, puppies' eyelids are tightly closed, and they can't see anything. Similarly, their ear canals are sealed shut, and no sound can penetrate. The ability to have fully developed senses at birth in mammals has to do with how long the gestation period lasts. Humans and cows, for example, mature fully in their mother's womb for nine months and can see and hear when they are born. On the other hand, the gestation period for puppies is only two months. The short pregnancy in canines may harken back to wolves; carrying a belly full of puppies while hunting would slow down the mom-to-be. The official name for being born in this helpless state is "altrical," which means "to nurse" or "to rear." Pups need a lot of loving care before they can be on their own. During their first weeks, puppies use scent and touch to find their mother and their way around. When puppies are born, their eyes are still developing. Even if newborn puppies' eyes were open, they couldn't yet see. The lids remain closed to protect their fragile state. If opened, dirt or germs could hinder development. Even bright light could hurt their eyes. Puppies' eyes open about two weeks after they are born. But even then, two-week-old puppies won't see the world clearly. Their open eyes continue to develop for several more weeks. Two- and three-week-old puppies will be able to track objects with their eyes and judge how far away a toy or a moving object is. No matter if newborn puppies have pointy or floppy ears, they are unable to hear a thing in their new world. Puppies start to hear sounds around the same time they open their eyes. During the first two weeks of life, changes in pressure move the ear canals and other auditory structures in the ear into place. Because this is a delicate process, it's best for puppies to be in a quiet environment. Loud sound can damage a developing dogs' hearing for life at this young age. Once the ear canals open, puppies can hear most sounds, and the ears will finish developing in about a week. Once a puppy can hear, his hearing is far more acute than a human's. If you wonder why your dog can hear the UPS truck before you, it's because he can hear something four times farther away than people. Dogs can also hear a much wider range of sounds than people, including ones that are very high-pitched like dog whistles, and dog toys often have a high-pitched squeak that gets their attention. It's possible a puppy can develop an infection in its eyes well before they open. You might see swelling or pus caused by bacteria or a virus. Many times this infection affects the glands that produce tears. Puppies' immune systems are not yet fully developed, so they will have a harder time fighting off a pathogen. Prompt treatment by a veterinarian can prevent lifelong dry eyes and scarring that can affect vision. Similarly, an infection in a puppy's ears before six weeks of age can be serious because it can progress quickly. At the same time, antibiotics and ear cleaners that could help an older puppy with an ear infection can be too harsh on a recently born puppy's ears. Signs of an ear infection include a puppy shaking his head or rubbing his ears on the floor. There may also be redness around the ear canal. If a puppy's ears smell bad, that may indicate infection as well.